Anonymous sale; Phillips, London, 7 December 1993, lot 74. Anonymous sale; Christie's, New York, 29 January 1998, lot 192. A native of Zwolle, Grasdorp received his initial training in that town at the hands of his father. In 1697, after the latter's death, he travelled to Amsterdam, where he became a pupil of the still-life painter Ernst Stuven. His new master, himself originally from Hamburg, had been a pupil of Willem van Aelst (according to Houbraken) in Amsterdam and subseqently of Abraham Mignon in Utrecht. From the former he had acquired a feel for texture and elegant finish; from the latter a predeliction for the forest floor still life. Both these characteristics were passed in turn by Stuven to Grasdorp, and are clearly evident in the present work (compare, for example, with the forest floor by Mignon sold in these Rooms, 16 December 1998, lot 30); as with the majority of Grasdorp's forest floor still lifes, this should be dated to relatively early in the artist's sadly brief career, close to his apprenticeship with Stuven. 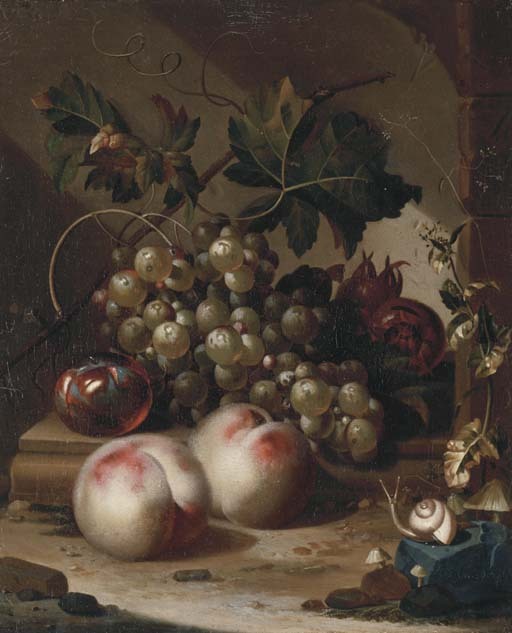 A similar still life with peaches and grapes on a stone ledge, and with a snail and lizard was offered for sale, Lempertz, Cologne, 12 December 1991, lot 64.